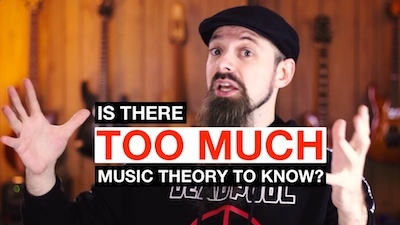 Are you feeling overwhelmed by how much there is to learn about music and music theory? Do you find yourself thinking that theory restricts what you can do and it's a bunch of information that you won't use? Or maybe you think that you are not good enough/smart enough to understand everything there is to understand? This video is a response to a comment from one of my subscribers. If you have questions you want answered or you want me to make a video on a topic you care about, you can contact me or simply write your question in a YouTube/FaceBook comment. Click on these link to find the courses Complete Chord Mastery and Master of the Modes. Like I say in the video, those courses are not for everyone, but if you are serious on the instrument, you owe it to yourself to check them out. For any questions send me an email and I'll be happy to help you!